The learning language resources on this page are resources I've actually used, and found at least somewhat useful. Duolingo is probably the best place to get started learning Esperanto. I wish Duolingo had Esperanto when I first started learning. You can follow my progress here. lernu! used to be the best place to get started in Esperanto. 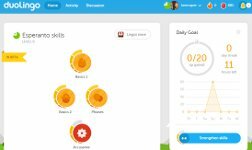 It's where I got started because Duolingo didn't have an Esperanto course yet. They have several free courses to take to learn Esperanto. I started with the Bildoj kaj demandoj course which is easy enough to understand if you a brand new beginner. You can also find other Esperanto learners to practice your Esperanto. Just browse the user profiles and look for users who say they'd like to practice with others. bab.la Esperanto/English Dictionary Unlike the other resources on this page, I haven't used this one yet. Benedetta from bab.la sent me an email asking me to add it to this resource page and I was happy to oblige. The site also provides free flash cards and quizzes to improve your Esperanto vocabulary. I used three different phone apps while learning Esperanto. I talk more in detail about Anki and Intense EO in my blog. Anki was the phone app I used the most while learning Esperanto. You can get the Android version or the iPhone/iPad version. After you install the app, you'll have to download at least one flash card deck. Go to "get shared decks" and search for "Esperanto". Out of the ones I tried, "Esperanto 101" was the most useful. Intense EO app for Android has its limitations, but is a pretty good app for increasing your vocabulary in Esperanto. I also used the Esperanto English Dictionary app. I only tried one dictionary app, so I don't know how it compares to others. There were a couple of times I couldn't find a word in the dictionary app, and had to look it up on lernu.net's dictionary widget. The only book I used with my Esperanto studies was Esperanto Self Taught with Phonetic Pronunciation by William W. Mann. I didn't get very far with it, mostly because I didn't like the order in which it taught Esperanto: several chapters of long vocabulary lists first followed by how to make sentences. But it's free on the Kindle Reader app. I also listened to an audio version of it for a couple of days. It helped my vocabulary a little, but not a lot. A company called Bookbox uploaded several videos of children's stories in Esperanto. The videos have Esperanto subtitles. I also listened to lots of Esperanto Music on YouTube. 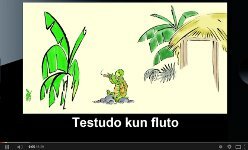 Lots (but not all) Esperanto music videos on YouTube also have subtitles, so you can learn the words and sing along.